Thank you Barleen‘s for sponsoring today’s recipe. As always, all opinions are my own. 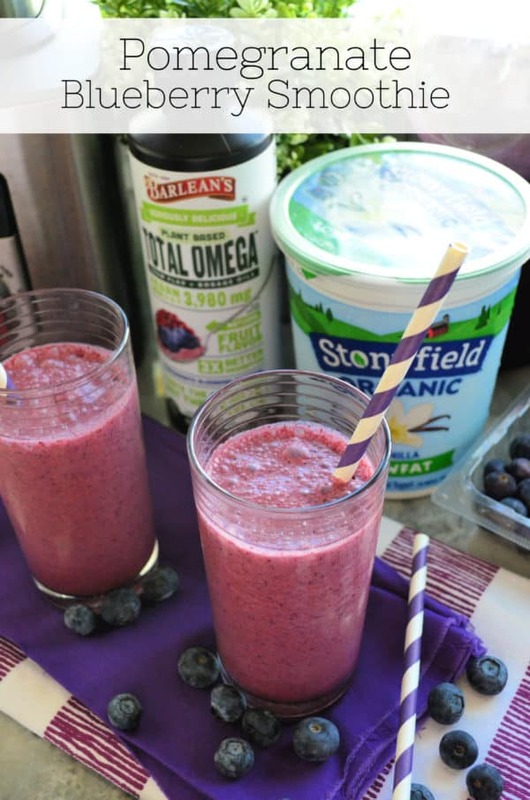 Brighten up your morning with this recipe for Pomegranate Blueberry Smoothie. Packed full of antioxidants and Omega 3’s you’ll never know it’s so healthy. My family loves smoothies! I typically tend to share more smoothie recipes in the beginning of the year. Every year I have a goal to share smoothie recipes throughout the year, and for some reason I fail every year at doing just that! Hopefully this will be the year that I actually keep up on my own internal business goal. It’s not that my family doesn’t drink smoothies year round. We tend to drink at least a few smoothies every week throughout the year. I think, for me, that it’s just coming up with new delicious smoothie combinations is where I tend to get stuck at times. I partnered with my friends at Barleans to share their new newly updated seriously delicious plant-based total omega swirls. It is 3 times more absorbable than regular flax & borage oils, and totaling 3,980 mg of pure omega in one serving!!! I love using the flavored liquid Omega’s in my smoothies to help get it into my families system without them even knowing. 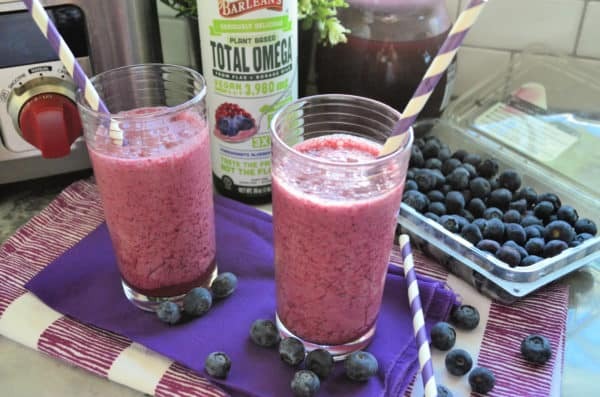 I love the Barlean’s Seriously Delicious™ Total Omega® Vegan Pomegranate Blueberry Smoothie. 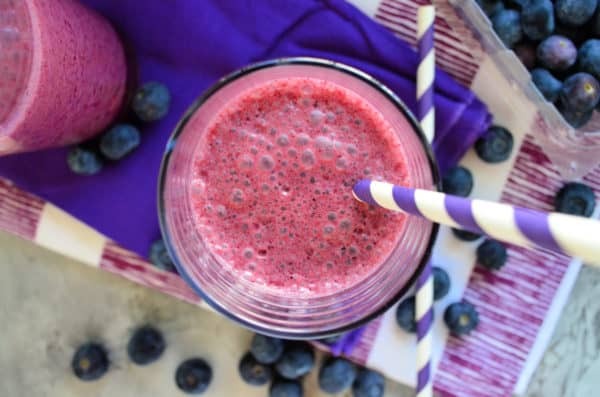 This pomegranate blueberry smoothie only has four ingredients to it! I don’t add additional ice. Instead I use frozen blueberries. I also found I didn’t need to add any sweeteners like Stevia or honey because the Barleen‘s Seriously Delicious was sweet enough. Everyone in my family devoured the smoothie. Including my sometimes picky 4 1/2 year-old. 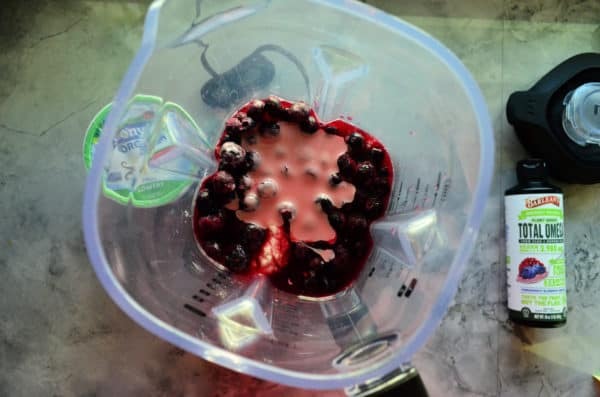 How do you make a pomegranate blueberry smoothie? First, you’ll add in the low-fat vanilla yogurt. I like to use traditional yogurt versus Greek yogurt. If you have Greek yogurt on hand no worries; however, your smoothie will be on the more tart side. Once the yogurt is in the blender then add in the pomegranate juice. Next add the frozen blueberries. 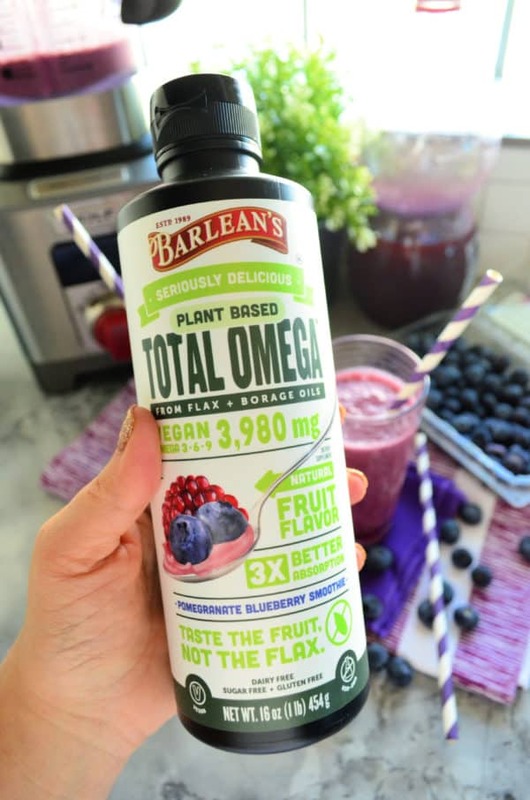 Lastly you add in the Barlean’s Seriously Delicious™ Total Omega® Vegan Pomegranate Blueberry Smoothie. My blender has a smoothie setting that blends the mixture for 45 seconds. It starts out slow and then ramps up to a high-speed. Depending on your blender will depend on how long he will need to blend. If you have a high-powered blender (like I do) then you’ll most likely have a setting like this. After about a minutes time you’ll have the most delicious Pomegranate Blueberry Smoothie. 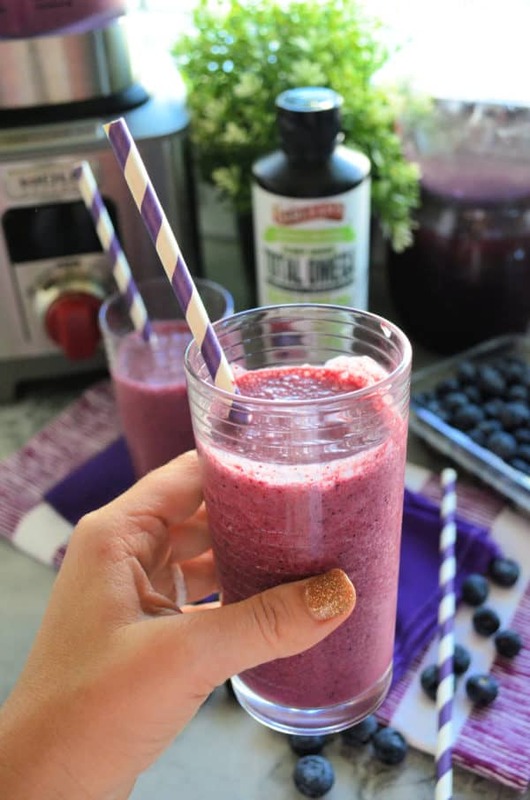 An extremely healthy smoothie full of antioxidants and omega’s!